This review has been a long time coming. Pamela Turner, creator and owner of Alaska Sweet & Spicy, sent me a samples of her Umami Sauce and vinaigrette months ago. While I posted the first review fairly quickly, the constant influx of products forced me to push back the vinaigrette review further than I had planned. Thankfully, I was able to put Alaskan Umami Mandarin Sesame Vinaigrette & Marinade to good use this weekend. With apologies to Ms. Turner, here (finally) is the review. 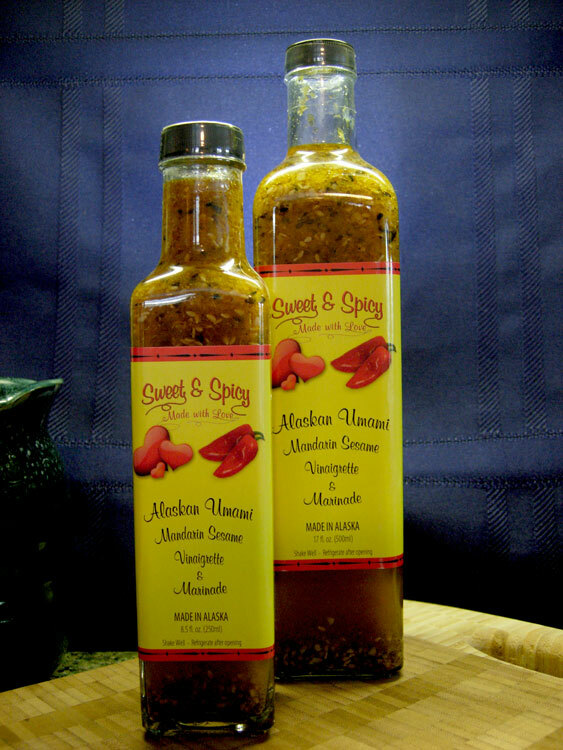 Alaskan Umami Mandarin Sesame Vinaigrette & Marinade is packaged in elegant tall glass bottles. They have a similar look to a quality bottle of imported olive oil. The dressing is available in 8.5 oz or 17 oz. bottles. Both sizes are slapped with Sweet & Spicy's bright yellow label. This vinaigrette starts with Mandarin oranges and apple cider vinegar giving it a strong, yet sweet initial tang. The vinegar is complimented with savory spices and unique oils like sesame, safflower, and orange oil. The coarsely ground garlic and pepper not only accent the flavor but also the appearance. When thoroughly shaken, the spices float well dispersed throughout the dressing. I used Alaskan Umami Mandarin Sesame Vinaigrette & Marinade as both a salad dressing and a marinade. I first sampled the vinaigrette straight on a fresh chopped salad. The dressing was superb on the vegetables. It was light yet provided a fresh citrus zing. I'm not typically a vinaigrette dressing guy, but perhaps that's because typical mass produced vinaigrette dressings don't match up to the fresh, quality flavors found in Sweet & Spicy's dressing. As a marinade, the vinaigrette was equally as good. I marinaded a couple pounds of chicken breasts overnight and threw them on the grill. I was really impressed with how well the flavor permeated the chicken. I didn't see the need to season the grilled bird with anything else. We enjoyed the chicken in wraps for dinner and chopped on a salad for lunch the next day. This vinaigrette dressing isn't limited to chicken and salad. I could see it being an excellent marinade for grilled shrimp or salmon. I'm planning to use the last of my bottle on some grilled cauliflower. Dipping hot bread in a bit of the dressing is a treat as well. All of Sweet & Spicy's products can be purchased on their website. Take a look and place an order. Be sure to let Pamela know that you saw her products on The "Q" Review. Don't forget to see how Alaskan Umami Mandarin Sesame Vinaigrette & Marinade rates on our "Product Reviews" page. 1 Response to "Alaskan Umami Mandarin Sesame Vinaigrette & Marinade"
She is a Master of these sauces and dressings! She works very hard to make these, and LOVE comes in every bottle!!!!! Love you Pam!